The explosion of file-based unstructured data is creating a number of new challenges for organizations in terms of both storage asset growth and efficient data management. At the same time, many companies are considering the use of cloud-based storage services to provide a more incremental and more elastic platform for long-term information archiving. 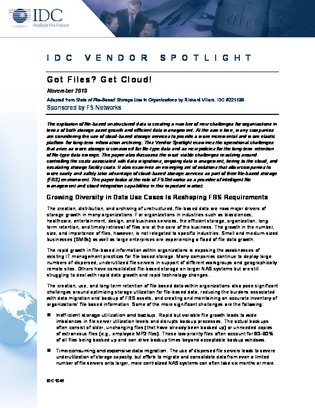 This white paper examines the operational challenges that arise as more storage is consumed for file-type data and as new policies for the long-term retention of file-type data emerge. It also discusses the most visible challenges revolving around controlling the costs associated with data migrations, ongoing data management, tiering to the cloud, and escalating storage facility costs. It also examines an emerging set of solutions that allow companies to more easily and safely take advantage of cloud-based storage services as part of their file-based storage (FBS) environment.